So, you've invested in a smartwatch or fitness tracker and you're looking to lose weight. But now what - how do you actually harness the power of the device sitting on your wrist? Well, in order to find out, we spoke to the fitness instructors responsible for whipping soap opera celebs, Olympic athletes and even Victoria Secret models into shape. Ultimate Performance is a name to look out for with its state of the art gyms in Mayfair and the City of London, and we grabbed its ex-elite sportsman turned full-time personal trainer Jonny Rees for a private session on how to use tech to turn those weight loss wishes into resolution realities. Just about any wearable will work as a pedometer and that pre-programmed 10,000 steps per day target is there by no accident. Any exercise you get is going to help improve your insulin sensitivity - a measure of how effective your body is at processing excess glucose. If you lead a sedentary existence, then your body gets progressively worse at dealing with blood sugar, has to produce far too much insulin in the process and, if things get serious, you'll develop type II diabetes; not good stuff. If, however, you're managing 10,000 steps each day, then studies have shown that you'll improve your IS threefold. That's an ideal scenario, but the good news is that there's no need to beat yourself up if you can't seem to reach that magic number every day, according to Rees. “Even at 5,000 steps, which is comparatively little, the impact will massively improve someone's insulin sensitivity and their ability to deal with carbohydrates. So long as you're hitting 5,000, that's the basic threshold at which you're going to get some sort of response." If you're dealing with carbs more efficiently, then you're effectively beginning to lose weight already. Hitting a step target is a great backbone to a weight loss programme. Start pairing that up with regular resistance training and you'll see the pounds dropping off. 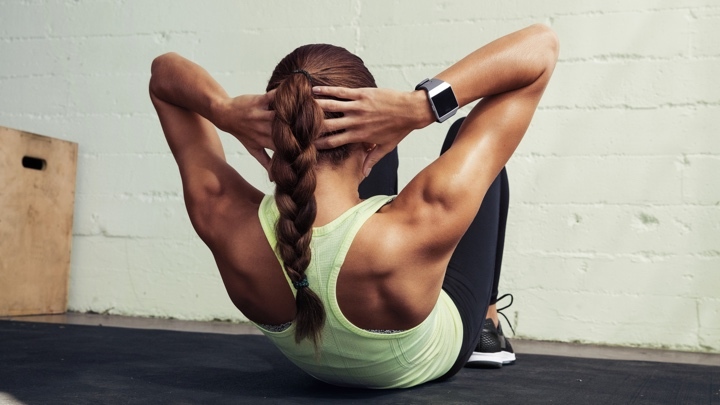 So, what is resistance training and how can we use wearables to help measure it? Well, the bad news for the gym-phobic is that we're talking about weight training - using your muscles to work against an opposing force. Now that opposing force may take the shape of gravity's effect on free weights, a machine with pulleys, a resistance band or even your own body weight by using squats, lunges, pull ups, press ups and so forth. “The ideal scenario would be 10,000 steps and a resistance training workout and then you'll be really on your way," says Rees. “Probably 3-5 times a week with three being absolute minimum. For body composition purposes, it's much better than steady state jogging, for example." Those that prefer to cycle, swim, run or any other non-gym-based activities, then there's no need to feel that you have to switch discipline completely if you're looking to lose weight. You will probably have to change your approach, however. Owners of half decent running watches will have noticed the option of interval training. What that boils down to is exercising at different effort levels rather than at a steady pace. So, instead of jogging along at 5mph for half an hour, you slot in some faster burns and slower sections here and there. Don't like the sound of that? You're missing out says Rees. “As a general rule, interval training will achieve radically better results in significantly less time. It's great if you're busy because you might only need 15 or 20 minutes of interval training rather than having to devote a whole hour, for example. It's about really going for it and then really backing off. A good place to start would be 30 seconds hard - 8 or 9 out of 10 - and then maybe one minute recovery down at 3 out of 10. You could do that running, cycling, rowing, swimming; it doesn't really matter your choice of exercise." Interval training is effective because of a phenomenon known as EPOC, excess post-exercise oxygen consumption which radically alters your metabolism. You might burn more calories during, say, 60 minutes of steady state jogging but, if you looked it at over a 24-hour period, your metabolism would be elevated for much longer with interval training. It's commonly referred to as the 'afterburn' effect and, for weight loss, it's the thing to aim for. So, it turns out that wearables with inactivity monitors like the Garmin Vivo-series, the Apple Watch or even the budget Xiaomi Mi Band 2 might actually be a very good idea. You need to have some consistency in your exercise regime and entirely fallow days don't do wonders for your metabolism nor your mental state. “Just keeping your level at what we'd call non-exercise physical activity (NEPA) - just moving around - is always going to help," explains Rees. “There's lots of evidence that sitting down for long periods of time can be detrimental to posture and it can make it harder to get moving correctly when you're down at the gym." “Ideally, move every hour or two; not a long way. Just walk over and talk to someone instead of sending email. Getting up on your feet and getting a bit of movement will make a difference and tends to help with concentration too." “People can lose a lot of fat just by improving their dietary habits," states Rees, although the story isn't quite as obvious as you might think. While calories do count, it's often more about shifting the types of food you're consuming at each meal instead of any kind of religious mathematics. “As a general rule, if someone's a little bit overweight, I reduce their carbohydrates and increase their proteins and good fat. When they get leaner, and if they're going for something specific, that's when tracking calories comes in. At the start, the counting is generally unnecessary. Making better food choices and exercise will make the biggest difference." MyFitnessPal is more or less the de facto standard of nutrition tracking platforms at the moment. With the service tied in with so many of the wearables out there (including Fitbit and Nokia), it's a great one to go for and will give you a decent picture of the balance of your diet as well as your calorie intake. By the same kind of means, it's equally possible to track your water intake using an array of mobile apps, and, yes, it's well worth doing too. If you're not great with hydration, Rees will start you on getting a solid 1.5 litres per day and work you up to around twice that. Water can help control calories because it stops you opting for sweeter alternatives and it helps prevent unnecessary muscle fatigue that might otherwise stop you getting to your exercise limits. Scales are one of those tricky areas - much like calorie counting - where Rees and other personal trainers hesitate to recommend. That way can lie neuroses and the gateway to all sorts of associated problems. Even if that's no danger for you, it can be something of a false economy. “Every single member of the 2003 England Rugby World Cup-winning team was morbidly obese on the BMI scale. It's just a calculation based on your height and weight. It's body composition that really matters." To that end, measuring body fat is a feature of the best smart scales. They might not be the most accurate, but as long as they're consistent in their inaccuracy, then you can still monitor progress. The advice from our expert is that once every couple of weeks should be enough for a good look at what's going on. Another fairly useful function that most fitness devices come fitted with now is the sleep tracker. Getting a perfect eight hours isn't going to make a massive difference to your weight loss plan, but noticing if you're coming up seriously short on an alarmingly regular basis is. “Its not so much one or two nights but if it's an extended period of lack of sleep, then it will reduce insulin sensitivity over a long time; a week of fewer than 5 hours of sleep, then that will start to impact," says Rees and if you're unlucky enough to be suffering in this way, then the effect is something of a double whammy. “If you're tired, you're more stressed and willpower goes out of the window. That can be the difference between grabbing that take away or grilling some chicken at home instead." Last of all, the key, according to Ultimate Performance, is to train SMARTER. Your regime should be Specific, Measurable, Agreed, Realistic, Time-based, Exciting and Recordable. That's a lot of things to take care of manually, most of which a wearable companion can manage for you. Good luck with your quest to lose weight with wearables and keep an eye on our fitness tracker and running hubs for more health and fitness tips.